This image is a compilation of three radar images from the Japanese ALOS satellite and shows the Po River, which flows over 650 km from west to east across northern Italy as the country’s longest river. 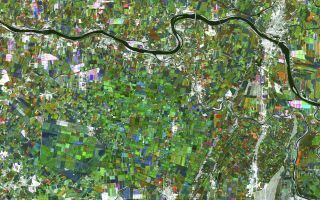 This cool space wallpaper is a compilation of three radar images from the Japanese ALOS satellite and shows the Po River, which flows over 650 km from west to east across northern Italy as the country’s longest river. Agriculture is one of the main economic uses of the Po Basin because of the fertile soils, and this image clearly shows a landscape dominated by fields.